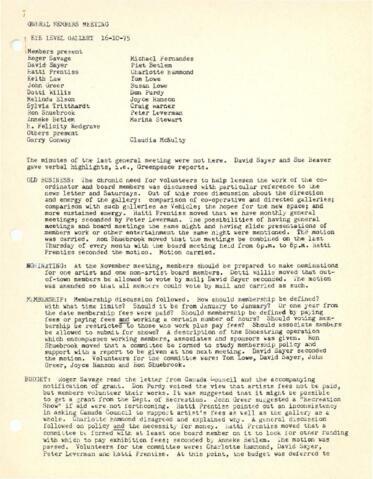 Item consists of meeting minutes from a general members meeting at the Eye Level Gallery. Topics discussed at this meeting included nominating members, the gallery's budget, a new space, a Atlantic Print workshop, the Last Tango auction, the gallery's cleanliness, calendar project, life drawing classes and a visual arts conference. Item also has a list of the attendees of the meeting.